Photo (Cold Lake Hospital Files). Dr. Savage was the difference between life and death as my sister lay critically ill.
To make sure they could get through to the lake your dad decided to harness one team of horses and follow the truck using the front ‘bob’ from the logging sleigh. If the truck became stuck they could use the horses to pull it through. We left at daylight. You stayed at the camp. 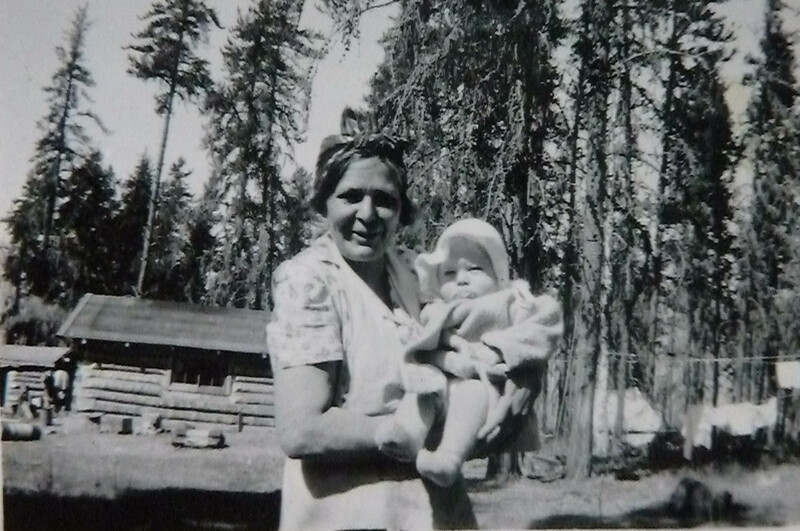 Photo: Hattie Wells holds baby Louise on one of our trips to Cold Lake. Later, after leaving LacLaBiche, Louise was cared for by Hattie Wells while I stayed in LacLaBiche. (When making the original post, I referred to this woman as my Aunts mother, Maggie Martineau (Delaney), but in April 2017, Susan Dalhseide (also from Cold Lake) provided information that the woman was Hattie Wells. I bundled Louise in blankets and held her while Tonnie drove and dad followed with the team. It turned out the men were correct, the roads were terrible. They ended up towing the truck most of the way to the lake, a distance of about 15 miles. Louise was still convulsing and her temperature going up. I was deathly afraid we would not make the hospital in time. At the lake we found the ice roads had been ploughed and were in good condition. Your dad drove the truck the rest of the way to town while Tonnie returned to the camp with the horses. After a week in the hospital Louise made a full recovery and was able to return with mom and dad to the camp and we got back to our normal routines thankful that Louise was back in good health. A couple of months later, before ice on the river would break up, dad wanted to go back to Birch Lake to see how Aunt Liz was making out and to pick up the rest of our belongings at the old home stead. To make the trip he borrowed a couple of logging trucks and, along with Tonnie, we all headed out for the one day trip. Aunt Liz and her three children were now living in our old home after her husband, Tart had passed away. Dad knew his other sister, Irene, was planning on leaving the Lakeview hotel to cook for one of the road building crews in southern Alberta, so it seemed logical that Aunt Liz, who was also a wonderful cook, might want to take over running the restaurant. Once at Birch Lake, it didn’t take long for that decision to be made and we soon had both trucks loaded with most of the worldly possessions of both families. On the way home, we stopped to visit with dad’s sisters Aunt Lola and Uncle Alex David, Aunt Mina and Uncle Ned Crocker and Aunt Hazel and Uncle Denny Dewan and other family and friends along the way. It was always hard getting away as everyone was so busy catching up on the several months since we had left for Cold Lake. On our arrival back in Cold Lake, mom’s brother, Melvin (Wheeler), and his wife, Aunt Hazel, who owned a home only a few doors north of the Lakeview hotel, offered Aunt Liz and her kids a place to stay until she could find a small home of her own. Life for Aunt Liz was slowly getting back on track. When we arrived back at the Martineau Camp the river was just breaking up and the crews were making the final rushed preparations for booming the logs to Cold Lake and new adventures for the McNeill family. 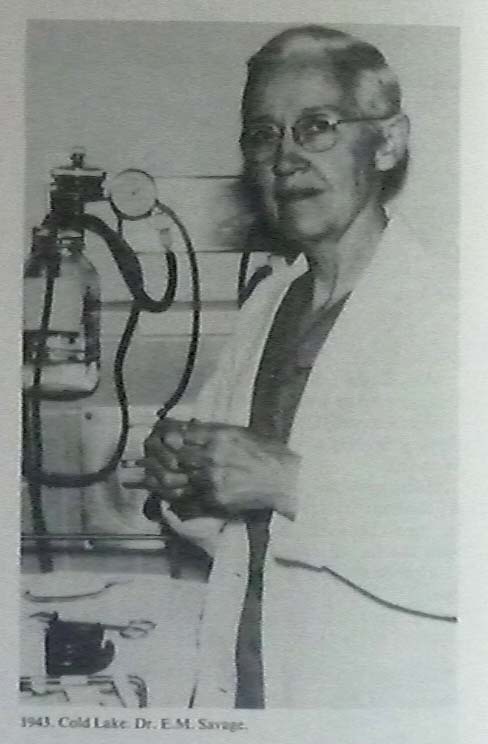 1 The residents of Cold Lake and area were most fortunate when, in 1943, the Women’s Missionary Society appointed Dr. E.M. Savage as doctor at the John Neil Hospital. It is not possible in a short footnote to express the loving care that Dr. Savage brought to so many people remote communities. Many dozens, perhaps hundreds of people would have become seriously ill and died had it not been for the immunization programs and care she provided not only in the hospital but through house calls which were made often made in the most dreadful conditions. Our family was one of the many that benefited from her life saving care. 2 Erysipelas is a superficial infection of the skin, which typically involves the lymphatic system. Erysipelas is also known as St. Anthony’s Fire, an accurate description of the intensity of this rash. Erysipelas was a feared disease in pre-antibiotic days, especially in infants. Hi, I’m Melvin & Hazel Wheelers Grand-daughter! I’m Tim Wheelers daughter. Hi Meaghan. I’m pleased you found the site. I’m still busy researching family history and more stories about the early years will continue to appear over the coming months.